I live in London and I feel like I see enough humanity when I am at home, when I am on holiday the less people/traffic/chaos I see the better 🙂 And yes you can probably call me a total antisocial. Apart from being antisocial I am also boring as hell, lots of bars, loud restaurants and clubs are definitely not my thing. Give me a palm tree and and an iced coconut and I am a happy girl. The temple lodge was by far the best hotel I ever stayed in. 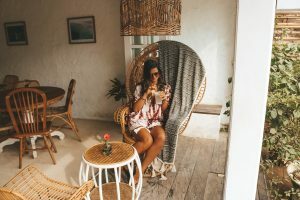 I am not a fan of big resort (something which i try to avoid as much as i can when travelling), I much rather stay either in an Airbnb or in small boutique hotels. Well, the Temple Lodge was simply my dream hotel. It’s tucked away in a quiet and calm corner of tropical paradise and overlooks the dramatic cliff of binging beach. It has different kind of bungalows and accommodations, all very distant from each other. The first 2 nights we stayed in Temple Suite which will make you instantly feel like a jungle princess. It has a private pool (never had that before in my life), a huge bedroom and an open air bathroom/shower. For 2 days it has literally been our corner of paradise. 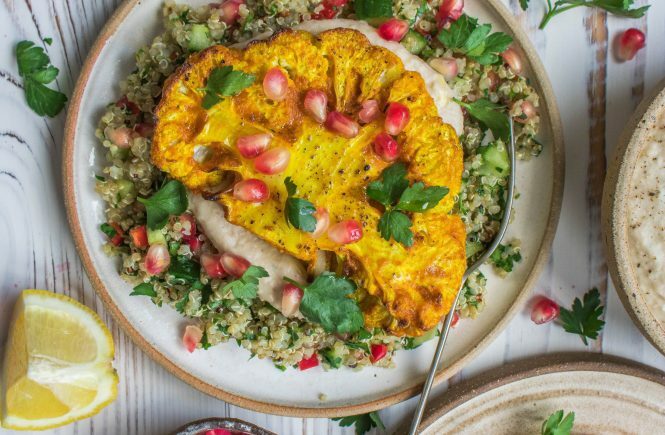 The small restaurant overlooking the beach serves daily dishes with lots of vegetarian and vegan options. Everything I tried was super delicious and fresh and they also have a huge selection of smoothies, juices and fresh coconut AKA heaven 🙂 I love that they are trying to be as eco friendly as possible so they only use bamboo straws (hurray) which you can buy as well, there is a water station where you can refill your bottles and all the toiletries and products used in the spa are very minimal and 100% natural and cruelty free. It really sounds like I am sponsored by this hotel ( I wish I was) but I can’t honestly recommend this place more. After Bingin we headed to what is considered the cultural centre of Bali, Ubud. Yes, I watched “Eat, Pray, Love” and I totally wanted to be like Julia Roberts and cycle through luscious green rice fields. Well, Ubud has definitely taken a special place in my heart as it has a very magical vibe which I haven’t found anywhere else. Although it can get quite busy and the traffic can go a bit crazy it still has a very Balinese languor and sense of peace and tranquillity. Although is inland there is sooo much to see! Neither of us can drive a scooter so we hired a taxi driver/ guide for 1 day and we went to visit rice terraces, waterfall and the Instagram famous Bali swing. 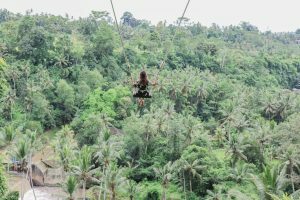 I would definitely recommend to visit the rice terraces and the waterfall, the Bali swing although I have to admit it’s pretty cool to swing over jungle (and you get awesome pictures) it’s also pretty expensive (£25 per person)and very very touristy. 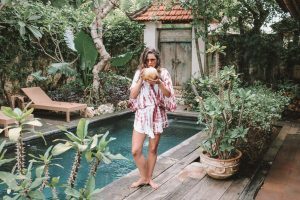 The other 2 days we just spent them lazying around Ubud, eating tons of vegan food ( at least I did! 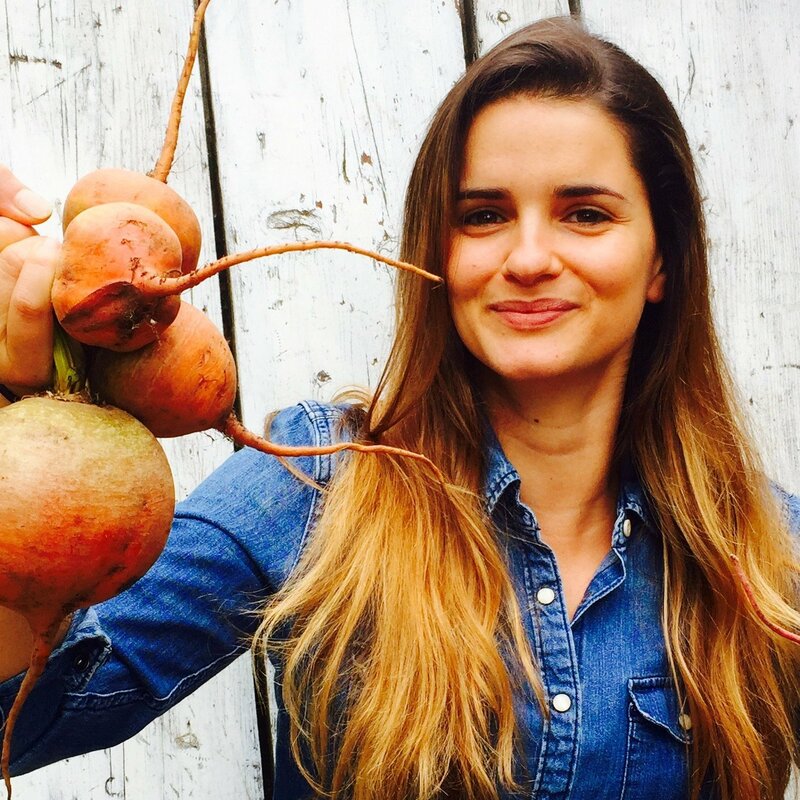 ), buying fruit at the market and just enjoying the atmosphere. 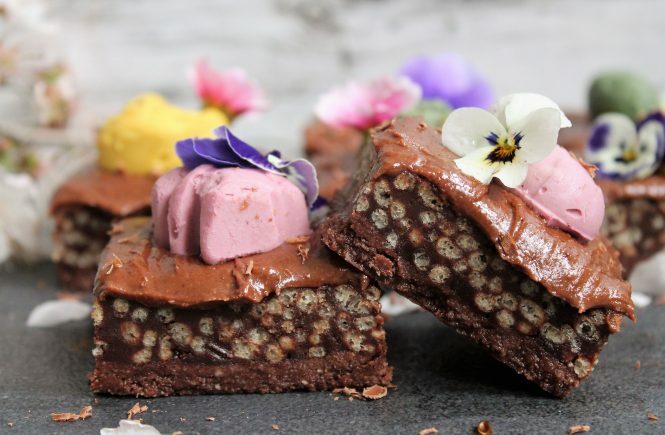 My favourite places to eat are definitely Seeds of Life which is a completely raw and vegan cafe with an insane cake selection and Acai Queen for mind blowing acai bowls. The last day we joined a medicinal herbal walk (Bali Nature Herbal Walks) which I loved and I would definitely recommend it if you are like me are a natural remedies fan. 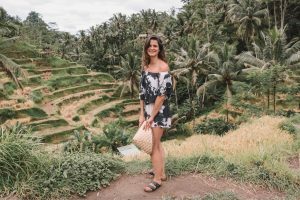 It’s roughly a 2 hours walk and get to see the gorgeous balinese country side with endless rice fields plus you get the chance to learn about the medicinal and health properties of some of herbs/fruits/roots grown in Bali. 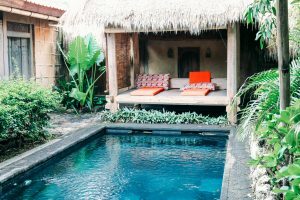 It’s a super well curated independent villa with a private infinite pool nestled in endless rice fields. 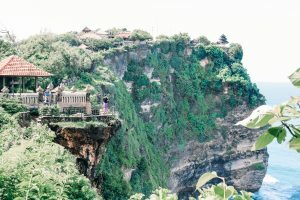 The only downside is that it’s 6-7 km from Ubud so you will need either a scooter or a taxi to get into town. 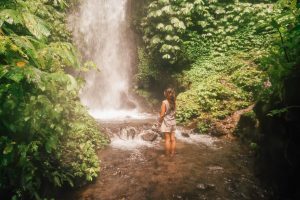 I would have loved to explore more the inlands of Bali as I totally fell in love with the luscious green jungle, the less touristy vibes and the cultural aspects but if you are visiting during the rainy season (December to March) things can get pretty wet. We were lucky in Ubud as we managed to do all our excursions when it wasn’t raining but we did have few very heavy storm. So we decided to head to Gili Islands where they always have better weather conditions even during the rainy season. We took a fast boat from Sanur and in roughly 1 hour and 1/2 we arrived at Gili Trawangan, the largest and I would say the busiest of the 3 Gili Islands. 1- Because the island is so small there are no cars or scooter (i guess there is no petrol access either) so for taxis and to transport supplies from the boats to hotels etc they use horse carriages. You guys know I am a huge animal lover (that’s why I don’t eat them) so for me seeing horses used in that way made me sad every time I walked next to one. 2- Long strip of tacky bars– again, call me boring as hell but the last thing I want to see on holiday is a karaoke, burger/ tacos/ all day breakfast bars everywhere. 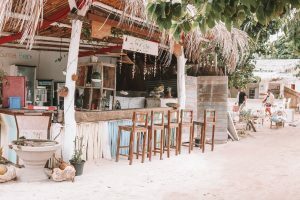 That’s why we always prefer to go to rather quieter and less busy places, I guess with Gili Trawangan we didn’t research into it enough. 3- Rubbish – this is probably going to be a constant theme from now on but Gili Trawangan was probably the worst. We stayed at the Villas Ottalia which in itself it’s a lovely hotel complex with independent bungalows with private pools. Unfortunately it was situated right next to the island’s dump which was constantly burning. Because of that all I could smell when I was in our room was burnt plastic. We actually went for a bike ride around the island and we found the dump and it was literally one the saddest thing I have ever seen, piles and piles of all sort of rubbish in the middle of palm trees with lot cows peacefully rummaging around. For all these reason we decide to leave earlier than we planned (we stayed 2 nights instead of 4) and to head to Gili Meno (the smallest of the 3 islands). In Gili Meno the hotel is situated directly on the beach and our bungalow was right on it so it was absolutely amazing waking up every day and just go straight into the ocean. There is no much to do on the island apart from chilling, sunbathing and snorkelling which was totally fine by me. The snorkel is absolutely amazing (the best I ever did) and you don’t need to do a boar tour, just get a mask and you will see amazing fish. 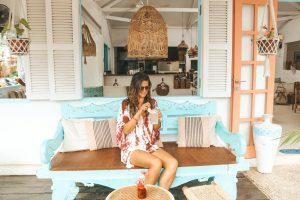 Overall the food on the Gili Islands was definitely not as good as Bali especially when it comes to vegan options. 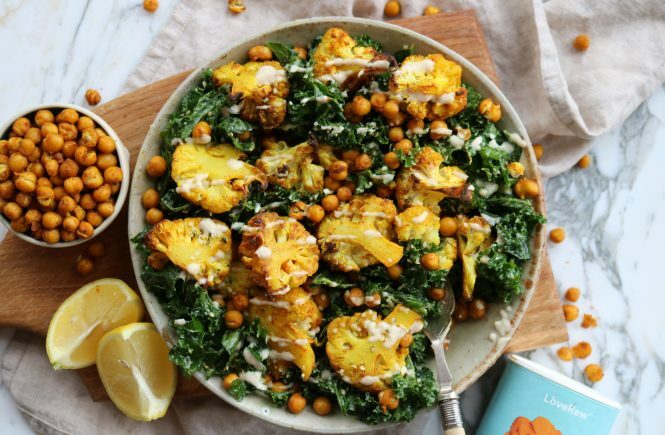 Although the Indonesian cuisine is very veggie friendly ( you can always easily order some veggies with tofu and rice) lots of restaurants were serving mostly seafood and fish and lots of touristy dishes, like burgers and pizzas which I am definitely not a fan of. After 4 blissful days of doing pretty much nothing we headed to Lombok. We took a boat to Bangsal and from there a bus ride all the way down south to Kuta. Similar to Bali north of Lombok gets the worst weather during the rainy season ( when we arrived it was pouring down) wether the south seems to always be relatively dry and sunny. 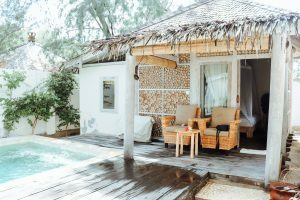 In Kuta we stayed at the Bombara Bungalows which is such a cute little spot away from the hustle and bustle of the town. 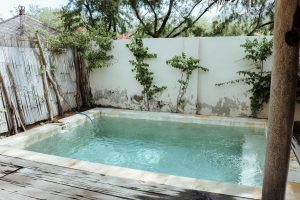 It’s a small hotel with only few bungalows and a communal pool in the middle surrounded by lots of plants and palm trees. 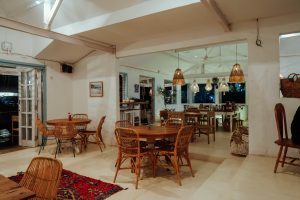 The hotel is 5 minutes away from Kuta beach which the Lonely Planet describes as quiet and hardly developed beach, well let me tell that is not the case anymore! Kuta beach really sadly is undergoing a huge development, 2 massive resorts are in the process of being built and its everything apart form quiet. 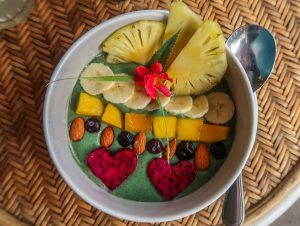 Kuta town itself is quite lovely and it has a nice buzz but is not overly busy, there are lots of places to eat, my favourite has to be Kenza Cafe has it has a huge selection of smoothies, juices, smoothie bowls (yesss) and lots of vegan options. As sad it might sound I think we ate there pretty much the whole time we were in Kuta. 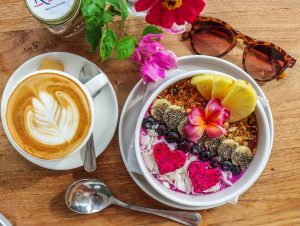 There is another cute spot for breakfast or smoothie bowls called the Yoga bar which similar to Kenza has a good selection of vegan options. 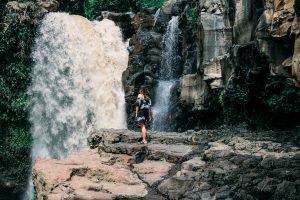 The highlight for me of Lombok was when we visited the Benang Stokel Waterfalls which are about 1 hour and 1/2 away from Kuta. 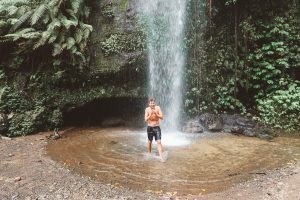 If you are visiting I would suggest to choose the options to see all of them, it’s a fairly easy walk of about 2-3 hours in total (including stopping and dipping in the water) and the luscious jungle is just breathtaking. I really felt I was completely away from everything, it was just the jungle, the water and us (+ the guide as you can’t do the route by yourself). 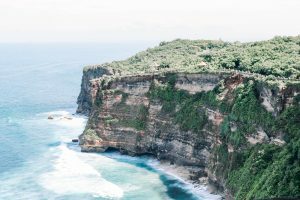 As simliar to Bali I felt that real beauty of Lombok was probably inland, in its luscious jungle and rice field, away from the busy touristy spots. Again if we were not visiting during the rainy season I probably would have loved to see more of the north of the island. The thing which I didn’t like the most about Lombok were young kids selling bracelets pretty much everywhere in Kuta and on the beach. Some of them were literally not older than 5-6 years old and it really broke my heart to see them trying to sell stuffs on the streets, in bars and restaurants. Apparently they told us they do it during the holiday season when they are not at school but nevertheless it didn’t feel right. Will these children being on the streets selling bracelets if they were no tourists? 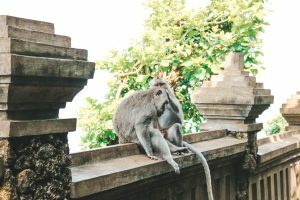 People – Balinese people are by far the friendliest and kindest people I ever met, they definitely made our stay extra special. 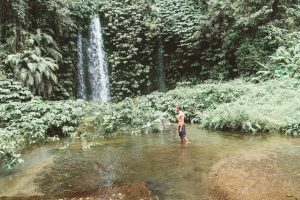 Nature/Jungle/Rice fields– If you are a natural lover like me you will be in your element, especially if visiting the inland of Bali. 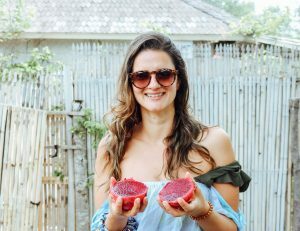 Food – Glorious delicious food (not so much on the Gili Islands) lots of vegan options, incredibly abundant tropical fruits, everything was so delicious and extremely affordable. 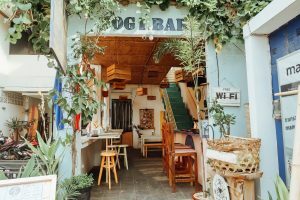 Bali dogs– sadly stray dogs are everywhere in Bali, some of them you can tell they had a pretty rough ride and again being an animal lover it really sadden me that nobody seem to care about them. Rubbish – especially on the Gili island rubbish is pretty much everywhere. Gorgeous white beaches which should be protected and cared are just left to get crammed with rubbished washed ashore from the sea. The locals don’t seem to care too much maybe because they don’t quite know what to do with it as the islands are so small and there isn’t any kind of rubbish collection in place. Kuta kids – As selfish as it might sound I just couldn’t relax properly while having a meal or walking in Kuta as lots of really young children were always out and about try to sell bracelets to tourists. And most importantly it made me so sad seeing kids on the streets instead of at home playing. I believe travelling sometimes also means facing things which we might necessarily don’t like or approve and in order to fully immerse ourself in the experience we should let go of all our judgements. By accepting what surround us as it is we can fully feel part of the country we are visiting. Every new country I visited has opened my heart and my mind a bit more helping me to become a more tolerant and compassionate human. 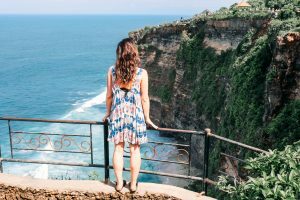 Thank you for reading this post, I really hope it can useful or inspiring if you are planning to visit Bali. I am off to Colombia in a couple of days so stay tuned for another travel blog post coming hopefully very soon!